I've admired Project QUILTING for many seasons. Last year I even planned to participate, but for whatever reason that didn't happen. Project QUILTING is a series of one week quilt challenges. That's not a lot of time to make a quilt from conception to finish! January 1 kicked off the new season and I made sure to keep my schedule clear enough that I'd be able to participate. I didn't think it would come down to finishing it in the last hour and posting to the blog in the last fifteen minutes of the challenge! The good news is that when you're reading this, you can probably already click over for voting on the challenge. (You get 10 votes; cast them by clicking on the heart you see at the top right of each quilt pic. Mine is #140.) (Voting has closed.) There are so many great interpretations (142 of them!) of the theme! This week's challenge was "Eight is Great!" There are so many great things that involve the number eight. The prompt mentioned a bunch of interesting ones: octopus, stop sign, magic eight ball, math, music... I started with sketches that involved music and roman numerals, and eventually thought of the repeating 8 8 8. This is season 8 of the challenge. The theme for this week's challenge is 8. And the quilt was due on the 8th. 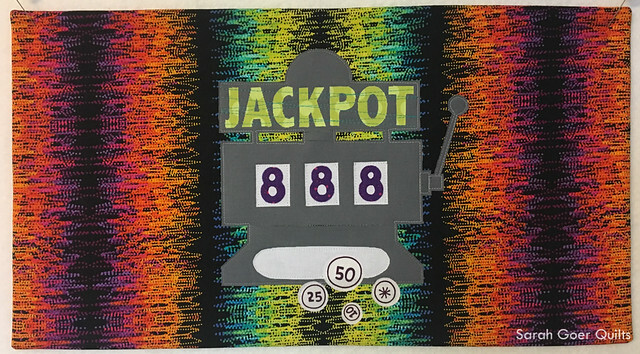 The image of three repeating eights screamed slot machine and my design was born. I initially sketched my design to also finish at 8" x 8", but in the end I wanted to see more of my colorful background fabric. I love that it makes me think of the light show on Fremont Street in Vegas. 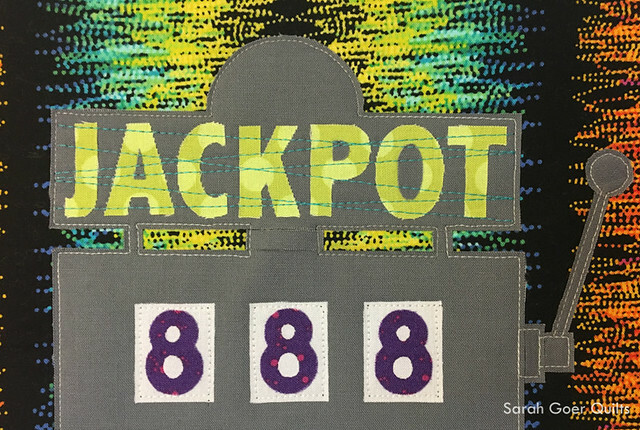 I also initially planned to piece the slot machine and only after calculating the sizes to cut all my pieces did I decide to use fusible appliqué instead. Here's my initial fabric pull. I later added the fabrics for the letters and numbers. You can see the fabric I fussy cut for my coins. The mini quilt finished at about 10" x 18". This is the second time I've done a faced binding. I used the faced binding tutorial that my friend Mel recommended. Such a great, quick finish for a little challenge quilt. Thanks for visiting! I'm linking up to Project QUILTING 8.1. 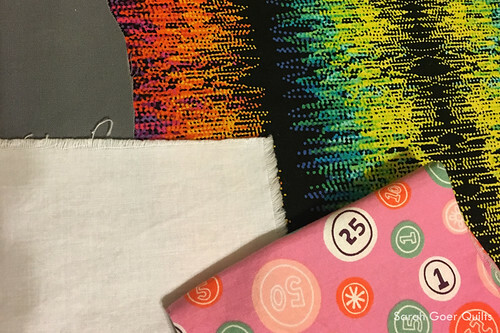 This month marks my blog's third anniversary and the addition of a twice monthly newsletter dedicated to color and design inspiration for quilting! Click above to stay in touch and receive modern and contemporary inspiration direct to your inbox! The first edition will be out by the end of the month. Posted in Quilting. Tags: challenge quilt, finished quilt, mini quilt, Project QUILTING on January 8, 2017 by sarah. Creative interpretation of the theme. I think this will provide you with good luck all through the year! Thank you Bernie! Good luck all around! Great interpretation of the theme, and you're right - it DOES look like Fremont Street! Great project! Thank you, Trish! I'm glad I managed to pull it off. Next week, no procrastinating! This is fantastic! I think it was brilliant to use fusible applique ;) So glad you joined in the fun of the challenge! Thank you, Kim! Thank you so much for hosting the challenge! Such an awesome turnout for 8.1! Wow! The background color is perfect for a Vegas type scene.